Committal Service funerals have a prior Church Service / Mass before arriving at the crematorium. The Committal Service usually lasts for about 10 – 15 minutes and are normally conducted by a member of the clergy and follow a standard religious format, not dis-similar to what normally takes place at a cemetery burial. The option to play non-religious music is normally available at this type of service. Full Service Funerals do not have a prior Service/Mass at a church before they arrive at the crematorium. The main service takes place at the crematorium and may last a full hour and as a result normally can only take place in the afternoon. Full religious Service is where a family bypass using a church and have a full length religious service according to their denomination. 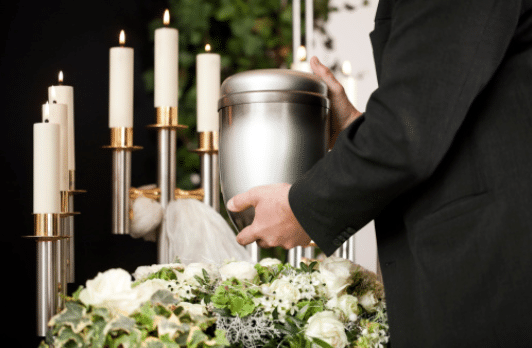 Non-Religious Service is a service designed by the family of the deceased and can be conducted by a Civil celebrant or a Humanist celebrant, or by a family representative. Strictly speaking, a Humanist Funeral does not have any religious element within the ceremony. Hybrid Service is a combination of the above where the family may wish a short religious content coupled with their own designs of music, speeches, poems or words of remembrance. This can be defined as a Civil Funeral. Non Service Funerals are funerals that have no service at the crematorium. They in effect by-pass all chapels and are brought straight to the cremator building for cremation. Extensive humanist and civil celebrants are available. These can facilitate, guide, and assist with the ceremony, as required.